My first NWKRTC Express journey..
Disclaimer: This is not about a recent journey. This trip happened quite a long time ago - in June 2015 to be precise. 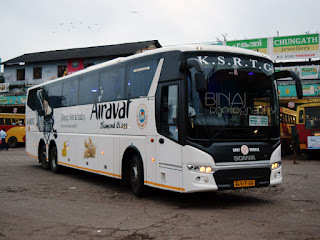 I've always heard great reviews about the driving style of NWKRTC Expresses (Vaayavya Karnataka Sarige, as they are called). I am generally not a fan of non-AC buses, especially when I've to travel over a couple of hours. I was appointed as an external examiner for practical examinations at a college in Chitradurga. It was about 4 hours away from Bangalore - too short for an overnight journey, and a bit long for a day-return journey. I did not want to travel overnight - since I'd anyways lose my sleep, and decided to leave early in the morning from Bangalore. 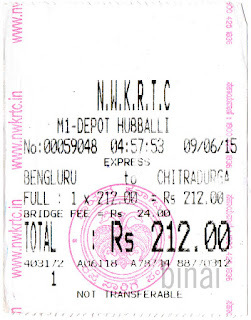 A quick search on the KSRTC website did not throw up any reservable services leaving Bangalore early in the morning. I wanted to be in Chitradurga by around 0930hrs, so that I can start the exam by 1000hrs and depart back by one of the Volvo services in the evening. I kept an alarm for 0300hrs and hit the bed the previous night. Like always, I tested the length of alarms the next morning, and woke up quite late. I left home very late and reached Majestic (the central bus station in Bangalore) sometime around 0445hrs - 45minutes behind my planned departure time. As I entered terminal 1, the cacophony of conductors calling out different destinations trying to attract passengers got clearer. 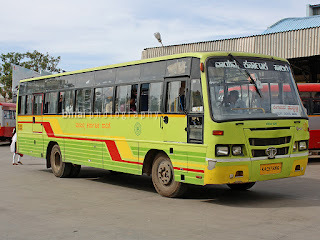 I could hear calls for Davanagere and Chitradurga among them - There were a couple of NWKRTC buses and 1 KSRTC bus in the departure day. 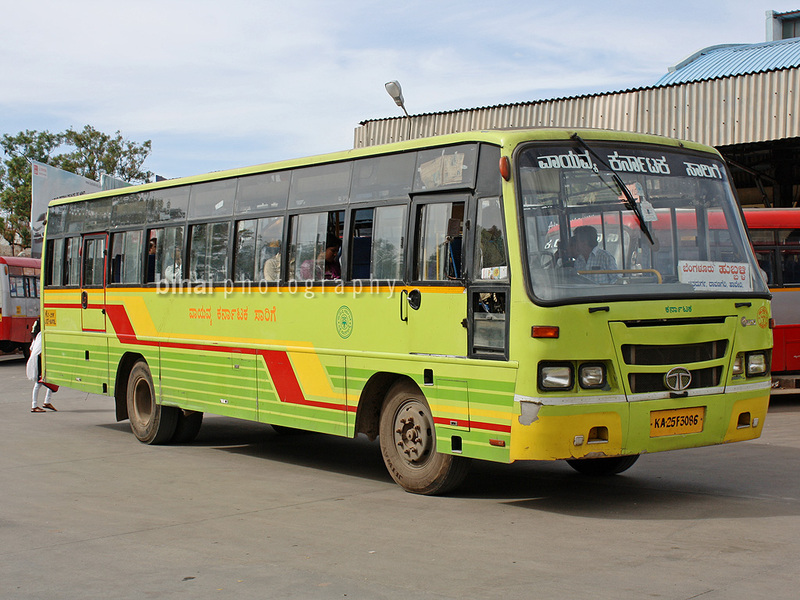 I did not look at the KSRTC bus - just headed to the conductor of one NWKRTC bus and asked him if goes to Chitradurga - he replied in affirmative. The bus, KA, of Hubli Mofussil-1 Depot was heading back home. I got into the bus and took a seat somewhere in the middle of the bus, on the left side - a window seat. The bus started moving out at 0457hrs - the conductor continued calling out Hubli.. Hubli.. Hubli.. as the bus picked pace and headed towards Navarang. It was quite cold outside, and I left the windows closed as the bus crawled through the empty roads of Bangalore. The ticket cost was Rs. 212. The bus kept stopping time and again to pick-up more passengers on the way - we stopped at Rajaji Nagar, Navarang, Govardhan Talkies, Goreguntepalya - you name it. We turned off from Tumkur road, and rushed towards the new Peenya Satellite Bus Station (Basaveshwara Bus Station), reaching there at 0523hrs. The conductor got off to get his waybill signed, and just made a couple of customary calls before we started off again (0525hrs) - the bus station was deserted, with just a few nomads sleeping at the bus station, and security staff around. The driver kept slowing down at every important junction. We finally crossed the last point in Bangalore - 8th Mile - at 0535hrs. Lights were switched off - it was still very dark outside - a feeble night lamp was the only light inside the bus. The driver picked pace, and really meant business. My gps consistently recorded speeds in the range of 80~85kmph all the time. I slept off soon after we crossed Nelamangala toll. I had a fairly nice and long sleep. 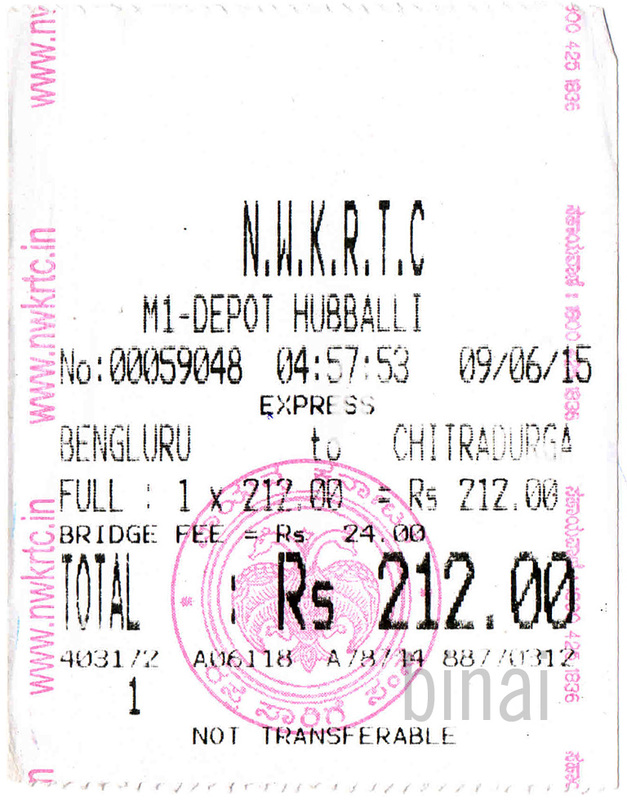 I woke up only as the bus pulled into Sira bus station - past Tumkur - at 0710hrs. I was quite surprised seeing an APSRTC Pallevelagu of Madakasira depot there - I wasn't really aware that AP wasn't very far from Sira. We started from Sira at 0713hrs. The driver was quite fast on the highways - he kept speeds in the 80s range all the time, and made great overtakes. He was quite calculative and did not make rash cuts or sudden turns. People kept alighting at isolated places along the highway. We pulled into Hiriyur bus station at 0750hrs - the crew announced a 15 minutes break for food and walked away to the sole canteen in the bus station. Hiriyur was a typical rural bus station - a small waiting area, a public comfort station, a small canteen and a stall selling miscellaneous stuff. The canteen - although small - was very clean. It had just enough seating for the people who arrived by this bus - and it appears this was the regular break for this bus. The people at the canteen were ready with breakfast - I had amazing Puri Subzi - slightly different from the Sagu that you get in Bangalore. The chutney served along was spicy and rich in taste. After a quick breakfast, I walked around the bus station a bit. The bus I traveled in..
We started off at 0804hrs from Hiriyur - the crew just stopped outside the bus station - and we filled in no time. 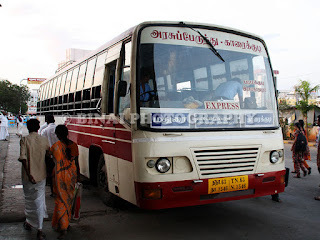 The bus was packed to the limits as the bus exited Hiriyur town limits. More people joined the bus at every stop we made - all the passengers looked like office/school/college goers - a lot of them had concession tickets as well. We finally reached Chitradurga at 0856hrs - 4 minutes before the promised arrival time of 0900hrs. 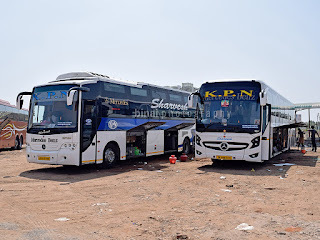 The journey was good - the driving very stable, and really an eye-opener about the driving style of express buses in Karnataka. I am used to seeing the crawling buses of KSRTC on Bangalore roads - this bugger was very different! He just ripped. Seating layout was slightly tight - not to my liking, but the seat itself was comfortable.